This term, I’m teaching a course in the folktale. We’re looking at stories by Grimm, as well as young adult novels that make use of folktales in interesting ways. Michael Buckley’s The Sister’s Grimm, Thomas Wharton’s The Shadow of Malabran, and Cornelia Funke’s Inkheart are three of the novels we’re looking at later in the term. Talking about folktales can be tricky—even in the classroom—because people have such different ways of looking at these old stories. It’s been more than two hundred years since the first publication of Wilhelm and Jacob Grimm’s Children and Household Tales, but these stories continue to get told, retold, and reimagined in print and film. Disney’s live-action version of Cinderella, directed—no less—by Kenneth Branagh, is due for release in March of this year. More and more often, clever commentators want to read these stories realistically—with a touch of irony. The underlying joke seems to be that a postmodern culture is too smart to be suckered by stories about princes and princesses who get themselves into all sorts of trouble, and who invariably live happily ever after. The sophisticated reader is expected to get the joke. Who, after all, could be taken in by such ridiculous stories? Funnily enough, Disney has made billions from reimagining these stories on screen, and endless numbers of parents and children alike have given up their time and money to watch them again and again. Reading folktales is challenging, and I sometimes fall into the trap of reading them realistically—against my better judgement. It’s always best to remind myself these are stories—stories to be told and heard, stories that speak to some fundamental human desires and anxieties, and, most of all, stories to be enjoyed. Here’s what happens if you try to read a folktale such as “Snow White” realistically. This is a story about a little girl, and it mostly seems to be about abuse. 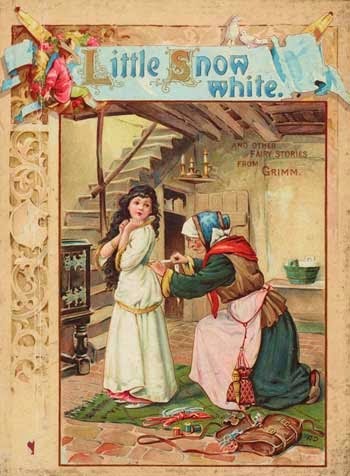 It clearly identifies Snow White as seven years-old. Is it her fault she’s beautiful? The queen is nothing short of psychotic for wanting to kill Snow White and then eat her liver and lungs. Being jealous of a child is weird enough, but this queen is clearly a narcissistic psychopath. Snow White isn’t killed by the huntsman (as instructed by our psychotic queen), but she is abandoned in the forest, where she eventually finds seven strange little men living together in a little house. Not only do these little men not contact the authorities about this lost child, they agree to let her stay as long as she will work as their house slave, doing all the cooking and cleaning. This is like trading one form of abuse for another. And then the crazy queen hunts Snow White down. This kid is either completely stupid, or she just doesn’t learn from people wanting to kill and enslave her. The queen arrives at the house of the little men. First, she convinces Snow White to try on some strangling lace, then to wear a poisoned comb, and finally to eat a poisoned apple. This kid does not get it. Snow White apparently dies twice, but the little men revive her. The third time she’s really dead—or at least mostly dead. The little men set her up in a glass coffin, where she lies on a hillside for a long, long time. This is where things get really disturbing. Presumably Snow White doesn’t age, as she’s mostly dead. This prince fellow comes along and falls in love with her—with a mostly dead child in a glass coffin. This prince is more psychotic than the queen. That’s it—I’m not reading anymore.